Doesn’t include: Accommodation, lunch, photography equipment. The north Somerset coastline is an ideal playground for long exposure photography with many striking subjects extending into the fast coastal tides here and South Wales as a superb distant backdrop. This county is also my home, and I have many years experience finding the very best locations to achieve very different compositions. 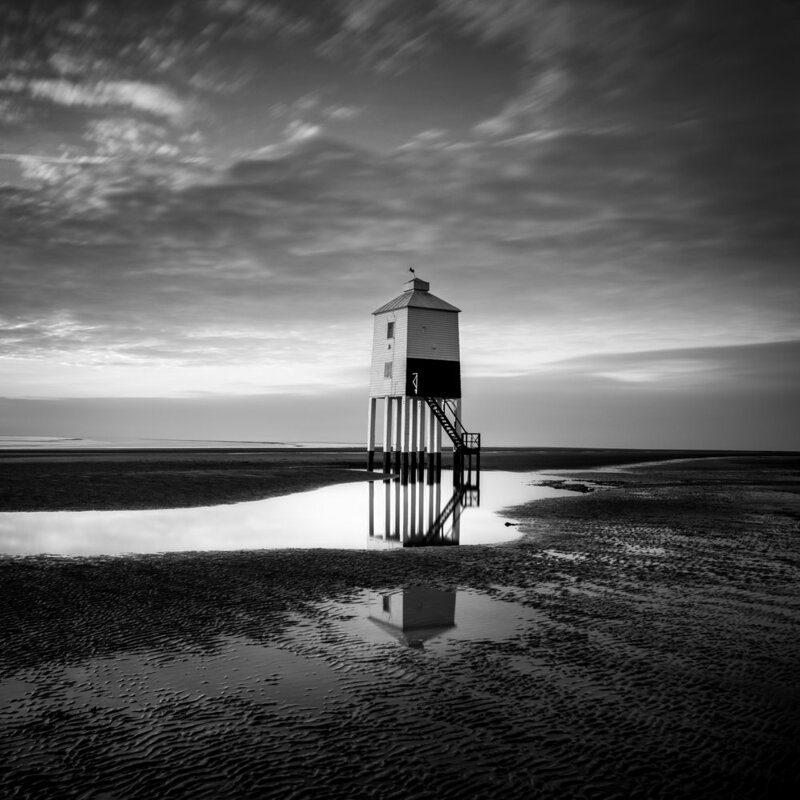 The workshop adjusts with the tides and light of the day, and you will get to explore some of the stunning structures and foregrounds this county’s coastline offers: from the majestic Clevedon Pier and tidal pools, to abandoned bridges, fortresses and shipwrecks. This workshop will help take your photography to the next level, with some unique techniques that I use in my own published photographic work. This workshop is limited to only 5 participants per workshop so I can give you maximum input. Photography compositional techniques specifically for coastal long exposure photography. The magic of daytime long exposure photography and how to bring ‘wow’ to your architectural or landscape photography. How to pre-visualise a scene and then make it stand out in your photographs. Using the ‘right’ ND filter to create the mood you need. Understanding histograms and how to use test images to save time and give you an advantage. Exposure calculation tips for accurately using high value neutral density filters for long exposure photography. Camera settings for highest quality fine art level photography output. Unique knowledge and locations to shoot long exposure and architectural photography in London. My own post processing workflow techniques that I use for all published work. Specific workflow areas using Adobe Lightroom, Photoshop, Nik Silver Effects Pro and Colour Effects Pro that will bring your photography to life. Learn about advanced retouching techniques in Adobe Photoshop using alpha channel selections, gradient maps, calculations and apply image masking, non destructive dodging and burning and zonal processing amongst much more. Understanding what makes a photograph stand out and how to promote a story and key elements in a photograph using light, cropping and contrast. Real time processing of some of the images you captured on day 1 to explore the power of editing software and advanced post processing as part of the photographers toolkit. A camera that has a manual (or m) and bulb (or b) mode. Most digital SLR and mirrorless are equipped with these. A sturdy tripod and head that can extend upto eye height. Prime or zoom lenses that covers a focal lengths of 24-70mm (Feel free to bring longer or shorter focal length lenses if you have them). A remote/cable shutter release with built in timer. A 16 stop, 10 stop and 6 stop neutral density filter (square or circular are fine). Spare camera batteries, chargers, a viewfinder cover and memory cards (recommend minimum of around 32gb of card space). A laptop for the second day with Adobe Photoshop installed on it.